The future is so simple to operate. The standard operating concept with click wheel and 4 additional operating keys on a removable operating unit represents a veritable highlight of the new Sigma X. A large illuminated LCD and an LED display for various operating statuses provide additional operating convenience. The timer, integrated as standard, controls timedependent metering processes. Relevant spare parts are shown on the display. 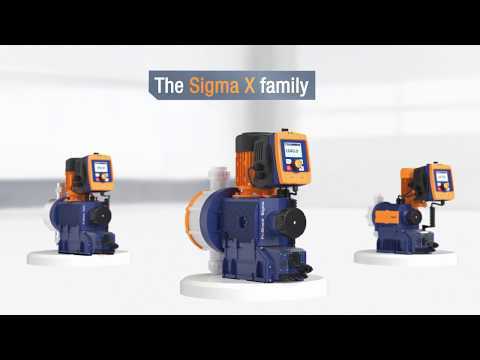 The Sigma X represents a durable motor-driven metering pump with integral control and patented multi-layer safety diaphragm, standing out on account of its excellent process reliability. An integrated relief valve protects the pump from overload and its bleed option guarantees reliable operation throughout the metering process. The new Sigma X delivers optimum metering results, thanks to its adjustable metering profiles. The combination of frequency and stroke length adjustment permits a large adjustment range, with the pump working with excellent precision over the entire frequency range. Adjustment of the movement profile also guarantees precise and trouble-free metering even with viscous and gaseous media. The new Sigma X is ready for Industry 4.0. It can be connected to process management systems via the integral PROFIBUS® and CANopen interface. Operating statuses are transferred remotely with ease via an additional output/relay module. The S1Cb, S2Cb and S3Cb versions allow the new Sigma X to cover a wide capacity range of 21 to 1,040 l/h, enabling them to be flexibly used in many different applications. Possible applications range from chemical metering, potable water and waste water treatment, disinfectant metering in cooling circuits to uses in the paper industry, plastics manufacturing and the textile industry. It’s got everything that makes a powerful pump even more advanced. Intuitive operating concept with click Wheel and 4 additional operating keys on a removable operating unit with the Sigma X control type. The three-stage LED status display for operating, warning and error messages, visible from all sides, enhances operating safety. The large high-resolution LCD clearly displays key Parameters. The Sigma X can be connected to the web-based DULCOnneX platform via CANopen and the DULCOnneX gateway. DULCOnneX by ProMinent represents the intelligent solution for digital fluid management. DULCOnneX allows us to connect all the components of a system, ensuring the optimised interaction of metering pump, controller and sensors. Users benefit from direct access to all information about the equipment and systems installed on site. DULCOnneX, therefore, enables the simple monitoring, analysis, and optimisation of processes. The basis for digital fluid management: products with Extended Connectivity. DULCOnneX products, such as the new Sigma X, boast features that enable digital fluid management. They reduce the consumption of raw materials and help to minimise operating errors and downtimes. Durable: their construction ensures a long service life and a high level of availability. Adaptive: they automatically adapt to constantly changing operating conditions. User-friendly: they are easy to install and startup. Clear, intuitive operation ensures simple parametrisation, calibration, and storage. Network capability: At field bus level they communicate using CANopen, PROFIBUS® and PROFINET or can be connected via DULCOnneX to our web-based fluid management platform. Our Sales Team will be pleased to advise you.